Three undocumented mothers share their fears after the defeat of deportation relief programs. They have been many defeats in the struggle for undocumented immigrants in the U.S. to come out of the shadows. Bertha Sanles, a 37-year-old undocumented immigrant from Nicaragua, hoped the Supreme Court would back President Barack Obama's executive actions, which include a program that would let her stay in the U.S. So when she heard the high court's ruling Thursday, she felt like she'd been swallowed up by the earth. "I've been involved in activism and I've seen several defeats ... but this [decision] gave us a lot of hope. I was sure that I would finally have an identity in this country and not live with that fear of one day being separated from my daughters," she said, bursting into tears. On Thursday, the court deadlocked in a 4-4 tie in the case of U.S. vs Texas, which would have allowed Obama's two deportation relief programs, DAPA and DACA, to finally go into effect. The programs would benefit some five million people, including undocumented parents of U.S. citizens and legal permanent residents and undocumented immigrants brought to the U.S. as children. But the programs were blocked by an injunction resulting from a 26-state lawsuit in 2014. Now, the case returns to the Fifth Circuit with an uncertain fate. "The ruling hit me harder than ever," said Sanles, who came to the U.S. with her husband Rey Cayasso 16 years ago. She has two daughters, one who's a 22-year-old Dreamer and an 11-year-old U.S. citizen. Ever hopeful, Sanles had been collecting documents to prove she'd been living in the country for nearly two decades. "I was ready in every, every, every way, just waiting for this today. I was sure that this was really happening because the president did it following the law," she said in a phone conversation with Univision News. "Mommy, it didn't pass. What are we going to do now?" When she found out about the ruling, Sanles rushed to tell her husband via text message. "The person who received it was my 11-year-old daughter, who called me crying and said, 'Mommy, it didn't pass. What are we going to do now?'" "She said, 'Mom, I'm afraid that they'll take you away. I don't want to go to Nicaragua.'" Sanles went on; "they don't understand the terror these children are experiencing. But we will continue on. The battle is lost, but not the war." Another undocumented person expecting a positive outcome from the Supreme Court was Dania Palma, a Honduran immigrant who lives in South Florida. 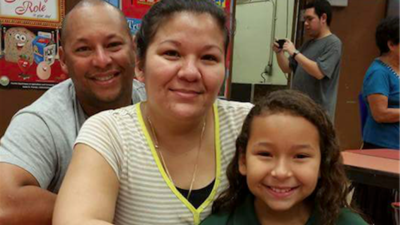 DAPA would have protected her and her husband, since they have children born in the U.S. However, her husband, Cesar Rodriguez, was deported. On July 23, 2015, he was arrested for a traffic violation. After being handed over to Immigration and Customs Enforcement (ICE), he was deported to Honduras. On September 21, just two days before trying to return to the United States, he was killed. Palma hoped for a positive ruling, but says she's "not giving up." She added: "There are so many people who come to this country to work and many are single mothers. We are not criminals. That's why immigration reform won't die, because we aren't dead." Gaby Pacheco, an activist and DACA recipient, was also awaiting news from the Supreme Court. Although she wasn't affected by the ruling, her sister was. Maria de Fatima Pacheco, 36, came to the United States in 1993 with Gaby from Guayaquil, Ecuador. "In 2012, when DACA was announced, she was a year older than the cut-off age but when the extension was made in 2014, she did qualify," said Pacheco. "For us, this has been very hard because we see that she keeps going and tries to improve [her life] but unfortunately the laws of this country don't [allow her] opportunities," said Pacheco. Her parents, who would have also benefited, will now seek a different route. Another sister, who's a citizen, will be able to apply for them. Pacheco's family exemplifies the complexity of the "broken immigration system." For her, "this is a very big problem; the Americans and those who say they did 'right way' don't understand the bureaucracy. The system is not at the level necessary for those people like my family to pay a fine or to do something so they can get their papers." Maria Bilbao, 50, came to the United States in 2001 from Argentina. She says that the ruling left her feeling knocked out. She cried all morning. "I had planned to respond to a victory. I never imagined that we would have this ruling. In my case, I'd been prepared since last year for my husband to apply (for relief from deportation)." Bilbao, who works as a maid, says that in 2015 her husband had a serious health problem and, being undocumented, couldn't go back to his country for medical treatment. "We had to start a fund-raising campaign because we needed $90,000. We managed to raise the money and find a doctor who operated on him for $12,000. But there are many people left out of the system, like us. It's very painful," said Bilbao. The doctor operated on her husband's hips. Bilbao's son Thomas, 25, is about to become a citizen. He says he will campaign for Democratic party candidates. "The only way we'll get immigration reform is if we win both houses [of Congress]. If we lose the House and Senate we'll be in the same situation, because these people are racist, they're hateful and we have a candidate who wants deport 11 million people," he said of presumptive Republican nominee Donald Trump. Mexican immigrant Cristina Serrano also fears for her two children, ages 10 and 12. She said she doesn't dare leave the house to avoid being arrested. Her husband, who works in construction, is the family breadwinner. Serrano's parents brought her to the United States when she was 11 years old. They left the Mexican state of Guerrero with the same goal as almost everyone who comes to the U.S. without papers: for a better life. "I don't dare take [the kids] to sports practice because on our street there are squad cars. During the week we stay inside so as not to risk it. I explain that it's not because I don't want [to go outside]; it's so we don't risk it."